efficiency = pe_getEfficiency('loadIdentifier',node) returns the efficiency of a circuit based on the data extracted from a Simscape™ logging node. Before you call this function, generate or load the simulation log variable to your workspace. To generate the variable, simulate the model with simulation data logging enabled. For more information, see About Simulation Data Logging (Simscape). To load a previously saved variable from a file, right-click on the file and select Load. Checking efficiency allows you to determine if circuit components are operating within their requirements. Blocks in the Semiconductor > Fundamental Components library and the Delta-Connected Load, Wye-Connected Load, and RLC (Three-Phase) blocks have an internal block variable called power_dissipated. This variable represents the instantaneous dissipated power, which includes only the real power (not the reactive or apparent power) that the block dissipates. When you log simulation data, the time-value series for this variable represents the power dissipated by the block over time. You can view and plot this data using the Simscape Results Explorer. The ee_getPowerLossTimeSeries function also allows you to access this data. Some blocks have more than one power_dissipated variable, depending on their configuration. 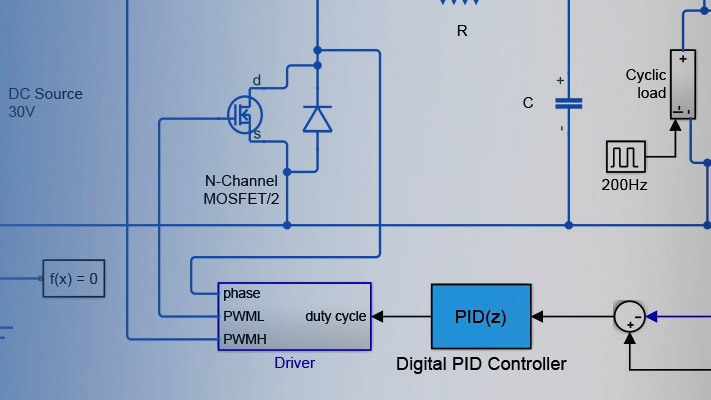 For example, for the MOSFET (Ideal, Switching) block, both the diode node and the ideal_switch node have a power_dissipated logging node. The function sums the power losses for both nodes to provide the total power loss for the block, averaged over simulation time. The function uses the loss data to calculate the efficiency of the circuit. The nonideal semiconductor blocks also have thermal variants. Thermal variants have thermal ports that allow you to model the heat that is generated due to switching events and conduction losses. If you use a thermal variant, the function calculates power losses and efficiencies based on the thermal parameters that you specify. Essentially, the power dissipated is equal to the heat generated. If you use a variant without a thermal port, the function calculates power losses and efficiencies based on the electrical parameters that you specify, such as on-state resistance and off-state conductance. efficiency = pe_getEfficiency('loadIdentifier',node,startTime,endTime) returns the efficiency of a circuit based on the power_dissipated data extracted from a Simscape logging node within a time interval. startTime and endTime represent the start and end of the time interval for calculating the efficiency. If you omit these two input arguments, the function calculates the efficiency over the whole simulation time. [efficiency,lossesTable] = pe_getEfficiency('loadIdentifier',node) returns the efficiency of a circuit and the power loss contributions of the nonload blocks in a circuit based on the data extracted from a Simscape logging node. This example shows how to calculate efficiency based on the power dissipated by blocks in a circuit using the pe_getEfficiency function. Data logging is enabled locally, and the option to limit data points is off. Ensure that all blocks that have power_dissipated variables are considered in the efficiency calculation. Enable data logging for the whole model. Designate the load. Rename the Wye-Connected Load block from RL to RL_Load. 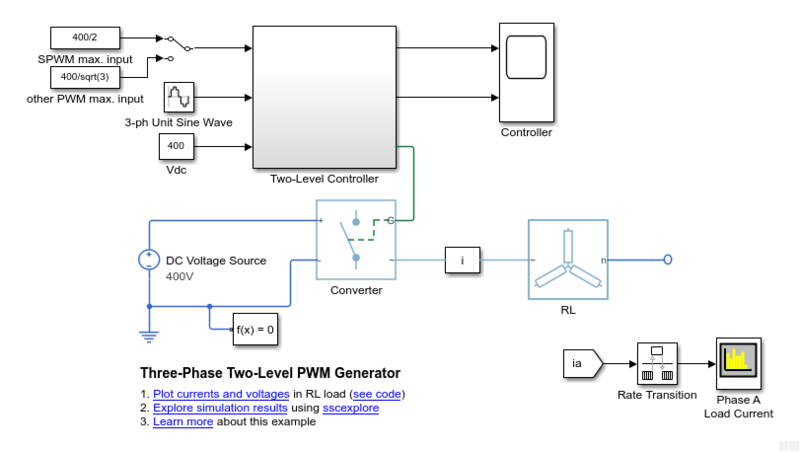 The simulation log variable simlog_ee_pwm_two_level is saved in the workspace. This example shows how to calculate efficiency based on the power dissipated for a specific time period using the pe_getEfficiency function. Data logging is enabled locally, and the option to limit data points is off. The model simulation stop time is 0.2 seconds. Calculate efficiency for the interval when the simulation time, t, is between 0.00 and 0.005 seconds. This example shows how using the pe_getEfficiency function allows you to calculate both the efficiency of the circuit and the power-loss contributions of the nonload blocks based on the power that they dissipate. Data logging is enabled locally, and the option to limit data points is off. String that is a complete or partial match for the names of load blocks in the circuit. For example, consider a circuit that contains the blocks shown in the table. The pe_getEfficiency function does not return the correct data for any of these 'loadIdentifier' values. A load-block naming schema that gives you better control over the output of the pe_getEfficiency function is shown in this table. The pe_getEfficiency function will be removed in a future release. Use the ee_getEfficiency function instead. The only difference between these functions is the function name. To prevent your code from generating an error when the function is removed, update to the new function name.